FADING PHOTOS star on the covers of Dublin rock band Fontaines D.C’s early singles, the images featuring a variety of street-famous Dubs of old. The story, we’re told, goes back to tales of local ‘characters’ passed down through generations in the west of Ireland. When the band set up in one of Dublin’s most iconic districts, in the shadows of Guinness, they kept hearing similarly compelling stories of local ‘characters’, and the stand-outs became a core part of the band’s identity. There are plenty who won’t immediately connect with the harsh, jarring backdrop to plenty of five-piece Fontaines D.C tracks. They’re a well-constructed affront: intense and pulsating, lyrically oblique and layered in a kind of tonal grit that makes the guitars scream and the speakers judder. The vocals are almost spoken, yet manage to twist and cut. Tracks like ‘Chequeless Reckless’, ‘Hurricane Laughter’ and pointed reference ‘Liberty Bell’ have got the band jetting around Europe, though a first album remains out of sight around the corner. “It’s going to be as live as possible,” bassist Conor Deegan of the album they’re working towards. “It’s all written. We’ll take a few days preparing and then go through it as we set up on stage, or as near as possible. We might get to it when we’re done touring.” There’s only a handful of touring off-days for the band between now and Christmas. 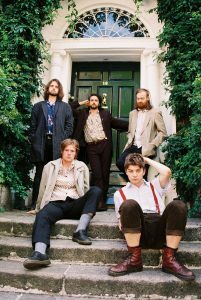 Fontaines D.C return to The Liberties to support Shame at the Tivoli Theatre on November 21, as part of their pan-European tour.